Join the UKs biggest companies and achieve huge growth by improving your customer journey at the very first touchpoint – online. 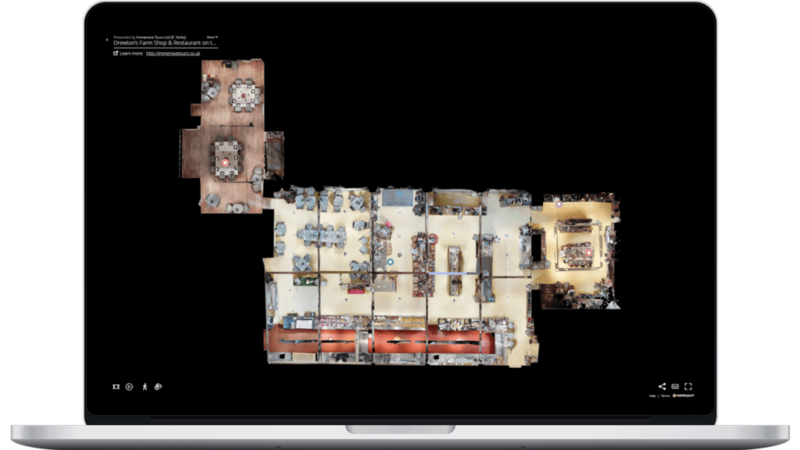 A 3D walkthrough tour of your business will be easy to use and delight customers by allowing them to explore, view menus or packages, and most importantly book direct via embedded links. Benefit from our unrivalled levels of expertise gained from working with some of the UKs most prestigious venues. We will work with you, using the latest techniques and technology to ensure your Matterport tour is not only an immersive walkthrough experience, but also an effective sales tool your team will love. When it comes to wow factor, the 3D Dollhouse model stands head and shoulders above the competition. Exclusively available to Matterport tours, this rotatable multi floor model strips away walls to allow customers to see inside any business in 3D. From a visual perspective virtual tours are stunning – but people still need information about your features to prompt sales and bookings. 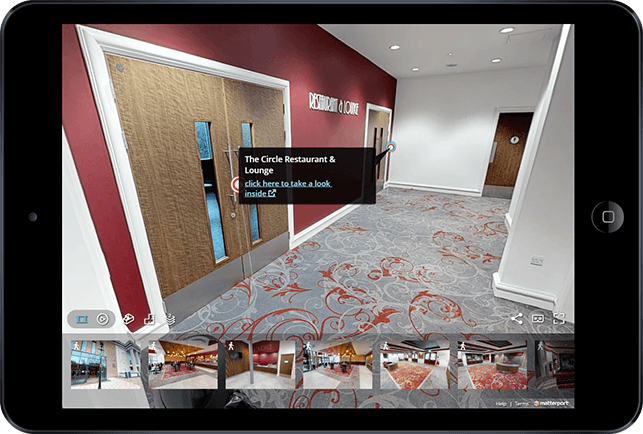 A Matterport UK Tour provides this with Mattertags – clickable links showing pictures, menus and even videos to wow website visitors. With Core VR, 3D showcase tours turn into an amazing Matterport Virtual Reality experience – giving customers the opportunity to explore business as if there in person using the worlds fastest growing technology! VR Tours come with every Immersive Tours package. It used to be be hard to explain floorplans and property dimensions – until now! 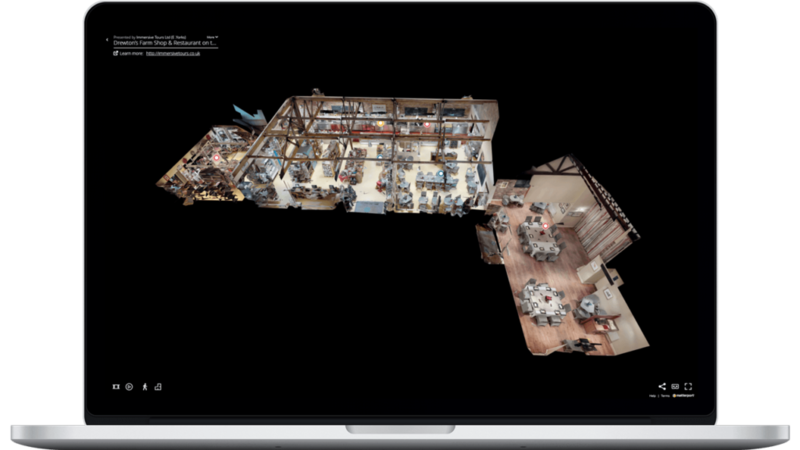 Matterport digital floorplans give clients a top down view of their spaces, helping end users easily visualise rooms. Sales teams and larger venues find this tool invaluable in driving bookings. 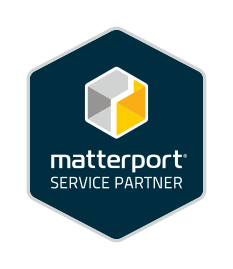 Immersive Tours are approved Matterport UK Service Partners – a 3D virtual tour company providing 3D virtual photography services to UK clients. We have a wealth of experience shooting 3D virtual photography, specialising in hospitality, leisure and retail. Matterport Service Partners are 3D photographers offering their services to different sectors. 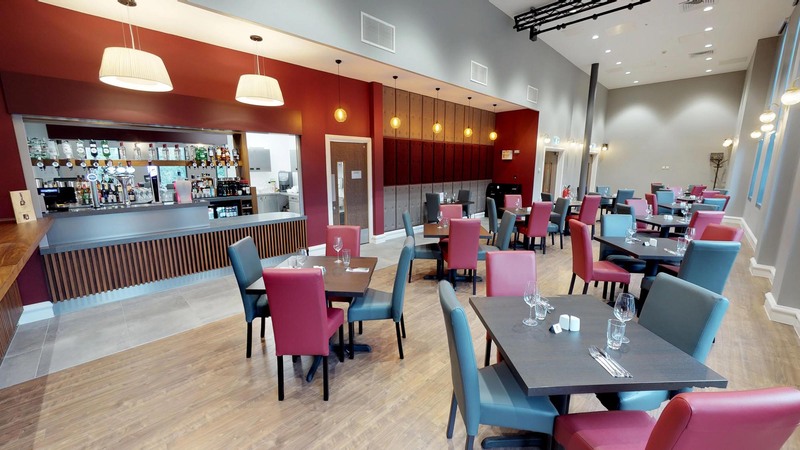 Immersive Tours specialise in 3D hotel virtual tours, 3D virtual tours of theatres, 3D virtual bar tours, 3D virtual tours of restaurants plus a range of other businesses. We provide all Matterport products: 3D virtual walkthrough, 3D Dollhouse and Matterport Core VR Tours. 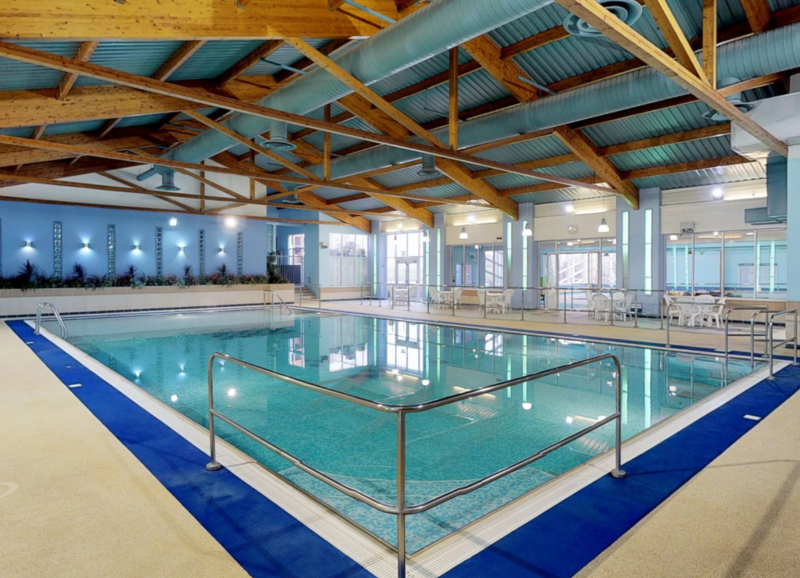 Our 30 years experience ensures we provide stunning virtual tours with market leading service. 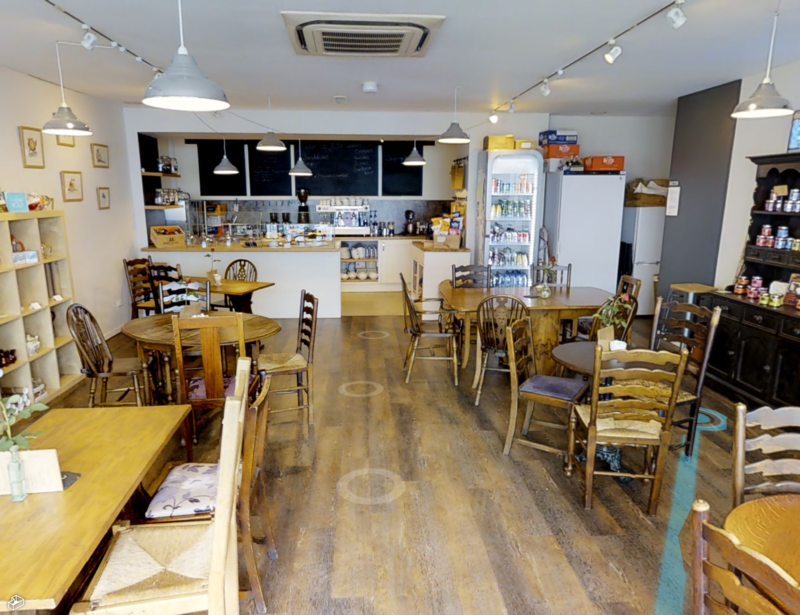 The facts speak for themselves when it comes to showing how effective a virtual tour can be for your business. Clients experienced huge tours visits of up to half a million in 12 months. Clients are happy with their results. Increased website visits per month. Immersive Tours are perfect for our business, the Tours have aided SEO and website traffic. Trust Immersive Tours, they are an Matterport Service partner. 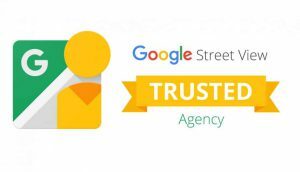 We are working on Google, Business and Street View. This has humanised our business.